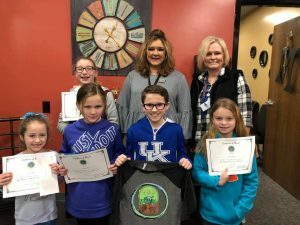 The Marshall County Conservation announced their winners today for the Jim Claypool Conservation Art Contest. The overall winner will not only go on to compete at the state level, but will have their artwork displayed on the T-shirt’s. Those recognized today were Avery Lyles, Campbell Hill, Emory Barrett, and Olivia Hawkins. The overall winner going to state was Austin Lyles. Congratulations! We are very proud of our talented youth.